Yesterday I shared with you guys about my Life Your Life List. Today I am going to share with you the Fitness edition. Although not as extensive as the Travel edition, it definitely has some large tasks that scare me (I am talking about you 26.2 miles). My fitness list is also one that I have already completed a few items on. I haven’t been adding new items when I complete them as I plan to finish this list and create a new one to start from. As my personal fitness goals are always changing, I like to re-evaluate often to see what has changed in terms of my obtainable goals. Evaluating not only my goals but the timeline and attainability helps to promote self-growth. Some goals are long term while others are something that can be completed and off the list within a few weeks. Why make these lists? Why not just do what I want without writing a list? I most certainly do things on a whim but I am a very organized person. A list helps to remind me of my goals as well as serve as a way for me to reflect on what I have done and what I want to do. Self-growth is a very important attribute that I have learned to embrace over the past year. 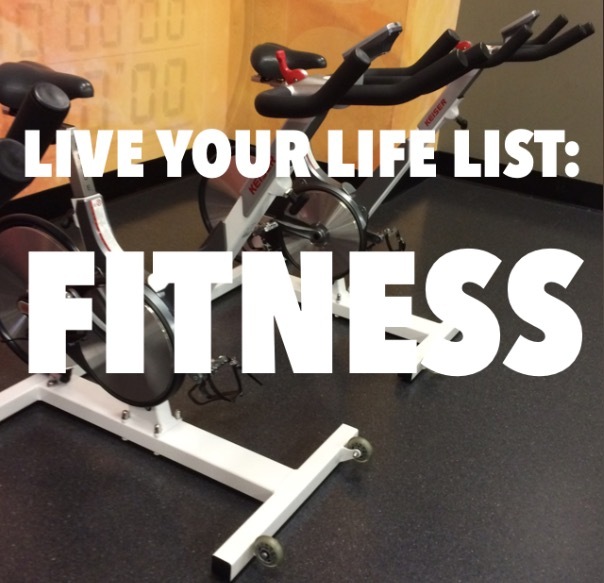 These lists help me avoid being stagnant in my personal workouts and my job as a personal instructor. So I challenge you: ask yourself what do I want to accomplish, put it in a list and get working on that goal! Go paddle boarding, surfing and parasailing I am a water girl all the way! I tried paddle boarding and absolutely loved it. Since then I have wanted to try more water activities and surfing is next on my list (preferably in Hawaii- kill two birds with one stone). Do one of every race- 5k, 10K, mud run, fun run, relay race, half marathon, duathlon, marathon, triathlon Although I did leave the hardest running race until last, I have my hopes set on the Rock N Roll Las Vegas in November for my first marathon. Then I hope to get back into biking early next year to complete a duathlon. Try Crossfit, Pilates and Zumba These are three workouts I have interest in but have not tried. Who knows what workout I could be missing out on? My new love could be waiting around the corner. Get my personal training certification This is one of my long term goals. As I am still new into group fitness, this one is on the back burner at the moment. However, it is one I would like to obtain by the time I am 30. Run a sub 2:00 half marathon My last half marathon started off slow for the first few miles, I kick myself for not weaving and pacing better because I was close. After my summer running break I plan to try a new training plan to get there and hopefully see the one as my hour, even if the minutes following are 59. Be able to do 5 pull-ups & a handstand How badass would that be? Ahhh, I can dream until I start putting the practice in. A handstand would require me to increase my yoga practice and pull-ups would require much more training to build a foundation. Get certified in additional group fitness classes Luckily the gym I teach at is very encouraging of getting certified for various classes they teach. New certification is supposed to open in June. My plans are get to certified in body works and kick box cardio. Complete my cycle recertification Maddog Spinning (my certification) requires you to complete your recertification every 2 years. I am in the process of completing the steps necessary but have plenty of time to finish. What are your current fitness goals? What races have you run/participated in? This entry was posted in Fitness, Group Fitness, Health, Race, Running, Workout and tagged Fitness, Group Fitness, Health, Race, Running, Workout. Bookmark the permalink.